Speak up sonny, I can't hear you. If your pet could talk, they might be saying that. Caring Hearts Animal Clinic offers comprehensive senior care to make sure they enjoy their golden years. Dogs and cats age faster than we do. While most family pets are considered senior citizens around the age of 8, we know that each pet is unique. Routine visits will allow us to monitor your dog or cat's aging process, and testing helps us determine when your pet reaches their golden years. Wellness exams—Up until now, annual wellness exams have been sufficient to meet the needs of your dog. 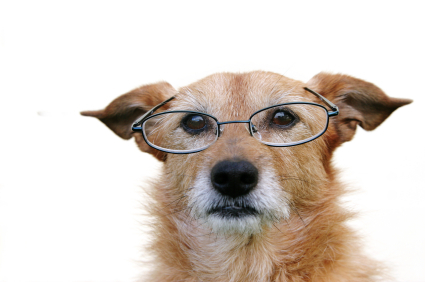 As they age, we recommend your pet come in every 6 months for exams, including a physical and dental checkup. This can allow preventable conditions like osteoarthritis, dental disease and heart disease to be discovered and treated early on. Diagnostic testing—In addition to more frequent exams, we will also order blood screenings every 6-months as well as other diagnostic tests. These tests show us changes in levels or baselines established throughout your pet's life. As your dog or cat ages, he or she may start to experience medical or dental issues. These may require the need for supplements, nutrients, or softer food or overall dietary changes. We are trained in your pet's nutritional needs and can help you find a food that meets your pet's needs. Keep them warm—As your pets age he or she may have a harder time maintaining body temperature. Giving them extra blankets, a sweater, or some towels will help them stay warm. Make surfaces slip-proof—Keeping them on all fours helps prevent orthopedic injury. In high traffic areas, use non-slip rugs to keep them from wiping out. Easy access—Make sure your pet's bed and food are close to the ground and are easy for them to get to, as they might have a harder time getting around. Also, giving them a soft, comfy bed will help them and you get a good night's sleep. Stairs—If you allow your pet on the couch or bed you should consider providing steps for him or her to use, as jumping may become more and more difficult and often painful.